The bandwidth of an oscilloscope or a spectrum analyzer or a probe determines the frequency spectrum that can be measured. 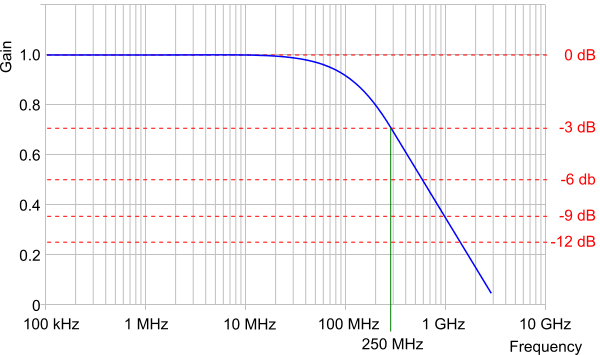 The bandwidth is specified as the frequency where the signal amplitude is reduced to -3dB (or 0.707 times) of the peak amplitude. When measuring a signal that contains higher harmonics (e.g. a square wave) it should be noted that the bandwidth should be sufficient to display these harmonics to a certain extent and not just the base frequency of the signal. Otherwise, the original signal will not be accurately restored to the original input.